Want to protect your executable files to be run by any unauthorized personnel? Now with a handy utility named as Empathy, you can modify the executable file to be password protected and only the person who knows the password is allowed to run the program. Empathy is designed with user friendly interface and is easy to use. Without any installation required, what you need to do is to unzip the package and execute the exe file. Once it is launched, just browse the specific executable file (that you intend to protect) and click on Protect button to create the password and that is all. From now onwards whenever someone try to execute executable file, he or she will be prompted for password. Empathy is compatible to run with Windows NT 3.51, Windows NT 4, Windows 2000, Windows XP, Windows Server 2003, Windows Vista, Windows 95, Windows 98, Windows Me. 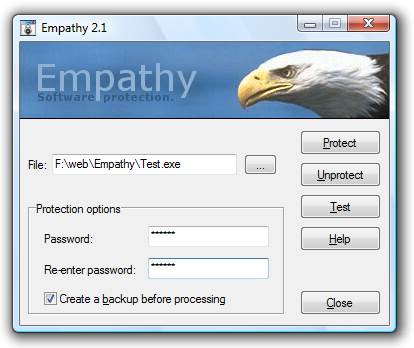 Empathy version 2.1 is a freeware but it only allows you to create a password with only 1 character. If you want to have strong password and use its all functionalities, you need to register by sending picture postcard to the developer so that he will send you an unlocking code via email. Click on Help button to get more details info of the registration.